Letter from David H. Pierce in Cleveland Heights, Ohio, to Governor B. M. Miller in Montgomery, Alabama. 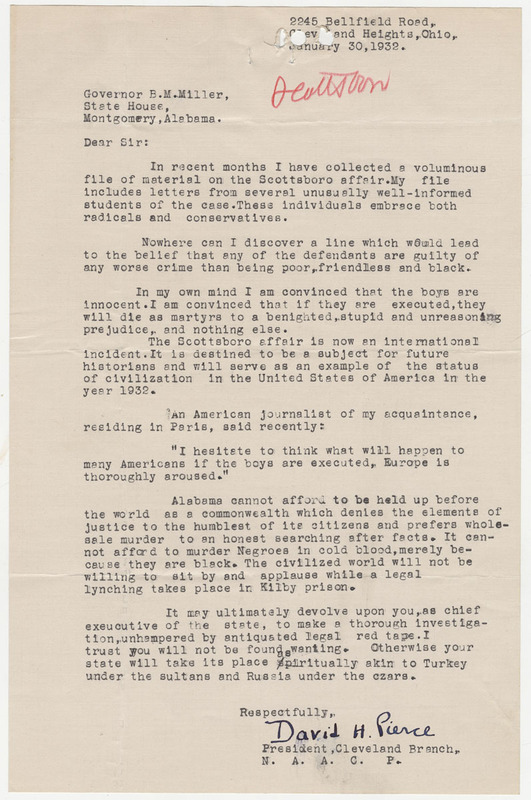 David H. Pierce, president of the Cleveland Branch of the NAACP, writes that he has collected a large file on the Scottsboro case, and given all the information, does not believe the boys to be guilty. He insists that if the Scottsboro Boys are legally murdered, they will become martyrs, whom future historians will study. He also mentions to Governor Miller that the state of Alabama cannot afford to be an international mockery, as the "civilized world" will not sit by. any worse crime than being poor, friendless and black. lynching takes place in Kilby prison. under the sultans and Russia under the czarz. N. A. A. C. P.
Pierce, David H., President, Cleveland Branch, N.A.A.C.P. (Cleveland, Oh. 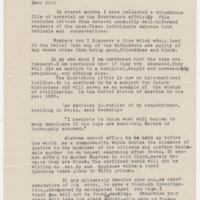 ), “Letter from David H. Pierce in Cleveland Heights, Ohio, to Governor B. M. Miller in Montgomery, Alabama.,” Scottsboro Boys Trials, accessed April 23, 2019, http://scottsboroboysletters.as.ua.edu/items/show/494.